Great value, but does 'good for the price' mean it's any more than OK? At just £600, the 50L4353 wears its main attraction right out there on its price ticket. But to be fair, that's actually not the only thing it's got going for it. All the talk in the TV world right now is of the hot new 4K/UHD and OLED TVs that exploded into action at the recent IFA technology show in Berlin. Exciting though such cutting-edge kit may be, it's also – for now at least – well beyond the affordability of your average UK household. Which is where the Toshiba 50L4353 comes in. For while it might not be stuffed with cutting edge features it most certainly is cheap, offering a 50in screen for just £600. This sort of value proposition, whether the TV makers like it or not, is much more likely to set tongues wagging among mainstream TV consumers than more pixels, higher contrasts and thinner designs. It's important to stress right away, though, that the 50L4353 is not just about saving you money. It manages to tuck in a few features too, including access to Toshiba's Cloud TV online system, playback of multimedia files from USB storage device or networked PCs, and even a 100Hz engine to try and combat LCD's common issues with motion blur. If you like the 50L4353's focus on value but want a different size, Toshiba also does the 39L4353 and 32L4353 at 39in and 32in sizes respectively. Or if by the end of this review you feel like stepping up a level you're looking at Toshiba's 6 series, containing the 40in 40L6353 and 32in 32L6353. Not surprisingly there isn't a great deal of competition for the 50L4353 at its price level, but one significant option we'll be considering at the end of this review is the Samsung PS51F5500. Many modern TVs can genuinely claim that their design is one of their most 'killer' features. But this isn't particularly the case with the Toshiba 50L4353. For while it's certainly not ugly, a rather drably finished and slightly plasticky surround together with a rear end that's much deeper than the majority of LCD TVs these days conspire to leave it looking rather old-school by modern standards. It picks up its game with its connections, though. Impressively for such a cheap set these include three HDMIs, two USB ports, and both LAN and integrated Wi-Fi network options. The Sony 42W653A by comparison only offers two HDMIs and delivers a 42in screen for the same money as the 50L4353. People contemplating wall-hanging a 50L4353 should note that, as well as having a deeper rear than most, it also opts to leave most of its connections facing straight out of the back, rather than making them accessible from the TV's sides. The USB ports and network connections on the 50L4353 can play a solid selection of photo, music and video file formats, while the network options additionally let you explore Toshiba's new Cloud TV ring-fenced world of online content. Not that it will take you especially long to run through everything, to be honest. For while we admire Toshiba for having totally revamped its Smart TV operating system and design this year, the brand really does need to get busy doing more content deals. The only services/apps of note, really, are the BBC iPlayer, Netflix, BBC Sport, BBC News, Viewster and Blinkbox. At the very least, Toshiba could do with getting the ITV Player, 4oD, LoveFilm and Demand Five onboard as soon as possible. Also damaging Cloud TV's appeal are the rather dated look to its presentation and, worse, some extremely sluggish reaction times when using the onscreen menus. This problem can make the TV quite infuriating to use at times. There are some good ideas in Cloud TV too, though. For instance, we got quite a lot of mileage out of the built-in recommendations system, whereby four onscreen avatars with different favourite content types scan the upcoming TV listings for programmes to recommend. Toshiba claims that at some point in the future this recommendations system will be extended to include recommendations based on a record of your viewing history. Toshiba also offers some impressive search engine flexibility to help you track content down, and we're huge fans of the way a Toshiba MediaGuide app syncs with your TV's listings and then lets you surf them on your smart device rather than having to interrupt your main TV viewing. There's a useful Calendar app too (currently only for iOS) that lets you share events input on your smart devices with an on-TV calendar. Despite being ultra-affordable, the 50L4353 is stuffed with picture calibration tools. In fact, with its colour management, white balance, gamma, backlight and dynamic contrast controls its flexibility humbles that of some TVs costing twice as much. These controls aren't just for show, either; use them carefully and you can get images that are surprisingly close to the levels required by the key industry video standards. This is particularly handy because the colours using any of the TV's presets – even the 'Hollywood' ones you'd expect to have been calibrated to deliver the most accurate images – don't look as natural as we'd like, with a tendency to infuse images with too much yellow or red. 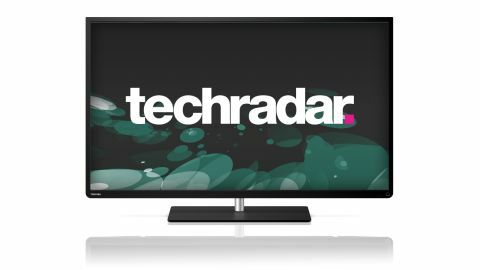 The 50L4353 is an LCD TV illuminated by an edge LED array, and perhaps surprisingly the panel is a 100Hz one, rather than the vanilla 50Hz that might have been expected at such a low price point. There's no local dimming in the edge LED lighting, but there is a dynamic backlight feature designed to continually optimise contrast.